Activision is hard at work recruiting new talent for a sequel to DJ Hero, which isn't particularly surprising except for the fact that DJ Hero doesn't come out for another month. We all know by now how Activision feels about sequels: It likes them, a lot. And none of us can pretend to be shocked that the publisher wants to turn DJ Hero into a franchise comparable to Guitar Hero, with tons of DLC and new entries in the franchise coming out on something like an annual basis. But doesn't it seem a little premature to be lining up a sequel when the first game won't debut for almost another full month? Apparently not. GamesIndustry claims that Activision is already out pounding the pavement in search of new talent for a sequel and future DLC. DMC Champion has already been "approached" about appearing in the follow-up, as has DJ Qbert, whose signing would be a "coup" for the game, according to the report. "Considered a pioneer of turntablism, [DJ Qbert] won multiple awards personally and as part of the Invisible Skratch Piklz, including a gong at the Sundance Film Festival for the movie Wave Twisters," it said. "He has also designed mixers and turntables for Vestax." I'm not ashamed to admit that I have absolutely no idea what any of that means but I guess it's pretty big stuff for fans of the genre - turntablistic, you might say. 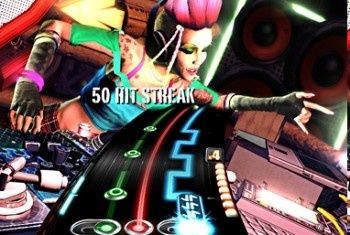 Activision certainly has high hopes for the game; in June, Activision Publishing CEO Mike Griffith said DJ Hero would hit a "more mainstream and expanded audience" than Guitar Hero. "DJ Hero is going to be expansive to the franchise and be particularly exciting for Europe where that genre of music is arguably more important than it is elsewhere," he added. He's probably right. DJ Hero will like sell a bazillion copies and make a hojillion dollars, but come on, can we slow down the stampede to Sequel-land? It's unseemly.